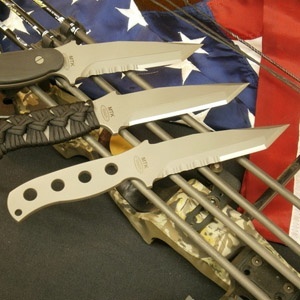 The MTK was developed in response to the military and Special Operation's request for a smaller CQB armor-piercing knife that doubles as a lightweight, non-magnetic pry bar tool. Like the larger MDK, the MTK has a distinctive false edge that can be readily sharpened as required, but with an angled back ending in a sharper point. It can easily be attached to the hip or thigh with the included Nylon sheath. The MTK is made with our special blend of titanium, which has very superior wear resistance and is thru-hardened to Rockwell C 47, while still maintaining its flexibility. This knife will never rust or corrode. The MTK is available in approximate 10"length, partially serrated or plain, with a skeletonized handle. Optional handles include G10 composite material with titanium screws or braided 550 cord wrap in your choice of color (ACU, Black, Blue&Red, Blue, Black&White, Desert Sand, Desert Tan, Bright Green, Multi Camo, Olive, Orange, Red, Red&White, Tan, Woodland Camo, Yellow&Black, or Yellow).